The Lion King on Blu-Ray brings all of the magic from its original 1994 release into the 21st century with bonus features and behind the scenes insight. The Lion King was the first film that I ever saw in theaters, and it has been my favorite film since childhood through my various stages of film fandom and snobbery. I stand by my claim that it’s easily the best children’s film of all time, if not one of the best movies of all time. It combines my favorites things: amazing Shakespearian plot, adorably over-the-top musical numbers, and big, furry cats. Seeing as how it was released only 17 years ago in 1994, it’s hard to say whether or not The Lion King has truly stood the test of time. Not because it doesn’t hold up, but because enough time hasn’t passed yet. However, if the current box office trends say anything, it’s that The Lion King holds up today, and it probably will for a long, long time. And why wouldn’t it? Yes, it’s a film about animals, but truly, it’s a film about people. It’s about power, anguish, regret, and bliss. 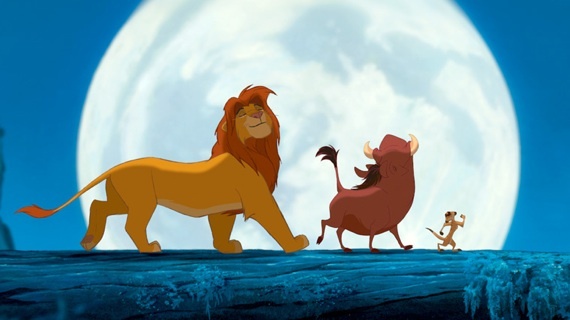 The storyline of Scar ascending the throne is an obvious one, but when Simba runs to Timon and Pumba “hakuna matata” style, (“when the world turns its back on you, you throw your back on the world”) that’s a bleak reflection of the real world. Throw in a wonky hornbill and some sketchy hyenas, and you’ve got The Lion King. Of course, the goosebump-inducing music of the film, be it the opening number or Be Prepared, is even more shocking on Blu-Ray. When I listen to Hakuna Matata, I want to hear every nuance of Nathan Lane‘s voice, and that’s exactly what you get. The special features on The Lion King Blu-Ray are few, but each is worthwhile. Deleted Scenes – These are all worth a watch. There are a handful of scenes in here, ranging from short in length to the entire scene where Scar considers marrying Nala with a reprise to Be Prepared, which can also be seen in the musical show. Bloopers – The “bloopers” here are cute, with staged silly moments like Rafiki dropping baby Simba. They can be seen on Youtube. The Morning Report – Anyone who bought The Lion King special edition DVD that came out a few years ago has already scene this song/scene, seeing as how it was inserted into the film. Pride of The Lion King and The Lion King: A Memoir – These short documentaries are the real gems of the special features, giving a sincerely in depth look at how the film was made, interviewing the producers, animators, and even showing some footage of the voice actors. Disney Sing Along Mode – Essential for the nerdiest of fans, this special feature surprised me in that it turns out that I’ve been messing up some of the lyrics to I Just Can’t Wait To Be King. And no, I still don’t know all of the words to The Circle of Life. Interactive Blu-ray Gallery – This gallery shows a lot of storyboarding images and sketches of all of the characters, which there’s also a lot of in the behind-the-scenes documentaries. Disney Second Screen – Disney Second Screen is some newfangled invention in which you can download an app or something that grants you access to additional material when you’re watching your film in second screen mode, but I don’t have the technology to make that happen. Dang you, you crazy kids! Overall, The Lion King Blu-Ray is a must for Lion King fans, Disney fans, and movie fans in general. It’s a fantastic film that’s made even more fantastic on Blu-Ray, with some great special features for the nerdiest of us. Remember who you are, and buy this Blu-ray.